A few days ago a patient came into my office for diabetes education. She was distressed because she had recently found out that she had cirrhosis of the liver. She rarely consumed alcohol. She told me that she knew that diabetes could cause vision loss, kidney failure, and amputations, but that no one ever told her it could be associated with liver problems as well. Generally, when you think of someone who has liver disease, you think of someone who abuses alcohol. You may be surprised to learn that fatty liver disease is often present in people who drink little or no alcohol. Nonalcoholic fatty liver is present in approximately 10 to 20 percent of Americans, and the incidence in type 2 diabetes may be as high as 50 percent. Although fatty liver generally cause no damage to the liver, it can lead to more serious problems under certain circumstances. First, some details. 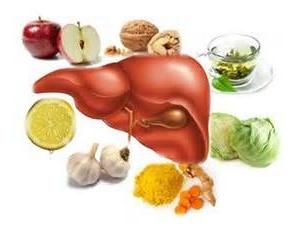 The liver is the largest organ of the body; it’s responsible for many functions including storing and releasing glucose for energy, storing vitamins and minerals, and making proteins. Other functions include breaking down many medications as well as alcohol, and making bile, a substance that is needed for fat absorption. Although the liver is a very resilient organ with remarkable power to regenerate itself, certain conditions, such as fatty liver, can lead to liver damage. The mildest type of nonalcoholic liver disease is simple fatty liver (steatosis). As the name suggests, fatty liver is a condition where fat accumulates in the liver. As noted above, fatty liver generally causes no damage to the liver. But under certain conditions, it can lead to a more serious condition known as NASH (nonalcoholic steatohepatitis). NASH can cause inflammation to the liver. This inflammation can lead to scarring and hardening of the liver, known as cirrhosis. Cirrhosis is irreversible and may lead to liver failure. Insulin resistance is almost universal in patients who are diagnosed with NASH. Other factors in its development may include the release of cytokines (toxic inflammatory proteins) and oxidative stress inside the liver cells. Since early nonalcoholic liver disease seldom has signs and symptoms, your physician may first discover it with a routine blood test. (Many cholesterol lowering medications require testing for certain liver enzymes.) The only definitive way to confirm it is a liver biopsy. Currently, the American Diabetes Association and the National Institute of Diabetes and Digestive and Kidney Diseases are funding research across the country to help identify the underlying cause and ways to prevent and treat the disease. Eat a heart-healthy diet containing a lot of fruits, vegetables, and whole grains. Limit your intake of saturated and trans fat. Control your blood glucose and blood pressure.